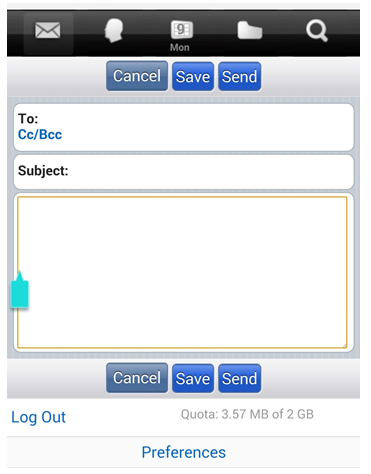 The Mail Mobile Touch Client application is used on touch-capable mobile devices. 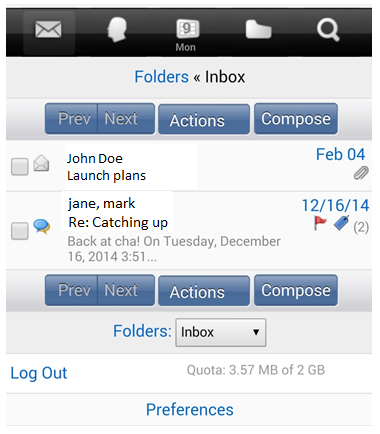 Its features are a subset of the features found in the Web Client (including Mail, Contacts, and Calendar). General functionality of the Mobile Touch Client includes the different layouts you will see when using a tablet or mobile device, switching applications (such as going from Mail to Contacts), and using search. Landscape View: A tablet in landscape orientation displays both panels, with the list panel on the left and reading pane on the right. The list panel remains visible while you are viewing a conversation or a contact. Portrait View: When a tablet is in portrait orientation, the list panel is superimposed over the reading pane, and slides back when an item is viewed. Tapping the Inbox button on the toolbar brings the list back into view. Using a Mobile Device - A mobile phone only displays one panel regardless of its orientation. When an item is viewed, its panel fills the display. Tapping the Inbox button on the toolbar brings the list back into view. Please Note: All screenshots seen below were taken with an Android mobile phone. Your actual display may appear a bit different based on the mobile device you are using. Action For a conversation you can mark conversation unread, flag conversation, move conversation, or tag a conversation. For a message, you can mark unread, flag, move, tag, or mark as spam. 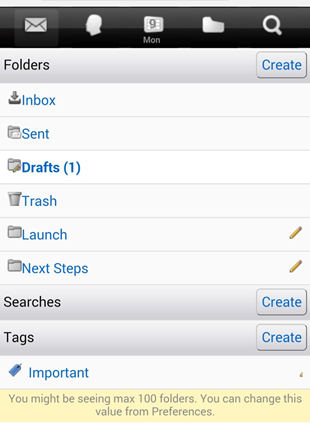 Attachment Tap the paperclip to add an attachment when you are composing a message. You can choose an existing attachment, or take a photo or video. Trash Moves the item into Trash. If you wish to retrieve an item from trash, you must go to the Web Client application on a desktop to retrieve the message. Retrieval from trash is not available from the touch client. We have included step-by-step instructions below on tackling the most common touch client features. Please see Most Common Mobile Touch Tasks listed to the right. Click on a feature description (e.g., Using Mail) and it will allow you to jump to specific instructions below. Then, click the browser back button to return to the top of the page. Step 2. 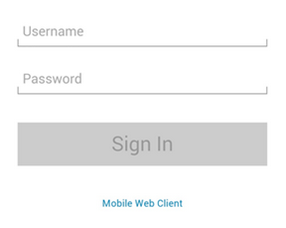 Enter your Username and Password, and tap Sign In. Please note that your Username is your full @candw.ky email address. When using Mail, you can view a list of conversations, read a conversation, compose a new message, reply to or forward a message, and perform various actions on either conversations or messages such as moving or tagging them. Reading Mail - Your Inbox displays conversations in the list panel. To read your mail, tap the conversation you want to read and it displays in the reading pane. Viewing a Conversation - A conversation is displayed as a list of messages in the list pane. The toolbar on top has buttons that allow you to reply to or forward the conversation, move it to Trash, or perform other actions such as tagging it, flagging it, moving it, or marking it read. Each message is shown as collapsed (just the header) or expanded (header and body). Tap the header to toggle between the two. By default, quoted content is hidden. Tap Show Quoted Text to display quoted content from previous messages in the conversation. If a message is tagged, the tag is shown in the expanded view of the message. Tap the tag to display a menu that you can use to remove the tag from the message. If a message has an attachment, it is shown in the expanded view of the message. Tap an attachment to view. At the bottom of the panel there is an input you can use to quickly reply to the conversation. Just type into the box and tap Send to reply to all participants in the conversation. Step 2. In the To field, enter the recipient’s email address. The address auto-complete feature displays a list of suggested email addresses. Replying to or Forwarding a Conversation - You can reply to and forward conversations or messages from a menu or by using the quick reply field. Using the Reply button: Select the conversation you wish to read. When the conversation displays, tap the Reply button. You can reply, reply to all, or forward the conversation. The latest message in the conversation is used as the original message you are replying to or forwarding. Using the Quick Reply field: To quickly reply to all, enter your message in the reply field at the bottom of the conversation and tap Send. Marking a Message as Spam - You can mark an individual message as spam by first tapping on the page corner button, then Menu and select Spam. The message is moved into your Junk folder. Using Folders, Searches, and Tags - Folders, searches, and tags are shown in the overview pane that slides in from the left. To display the overview pane, tap Menu. Your Folders display at the top of the overview pane, and you can scroll down to see Saved Searches and Tags. Step 2. A folder with subfolders displays an expansion arrow on the right of the folder name. Tap the arrow to display the list of subfolders. 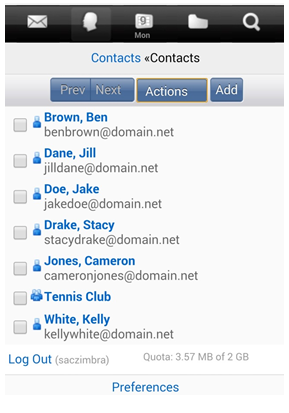 You can access your contacts using the Contacts application. Adding a New Contact - From the Contacts menu, tap Add and the New Contact dialog displays. Enter your new contact information and tap Save. Accessing and Viewing Your Calendar - From the Applications menu, tap Calendar to display your calendar. You can view your calendar by the month or day. 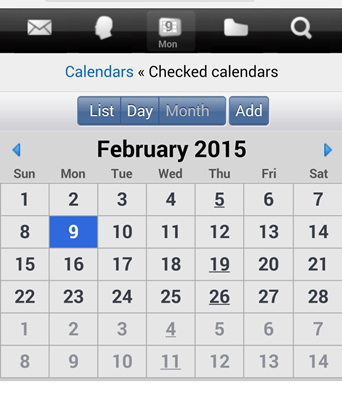 All calendars and events you own or belong to display in your default calendar view. In month view, a day with any events will display a dot. In day view, a description of the event appears in its time slot. From your Calendar view, tap Menu. Your list of calendar displays. From your list of calendars, tap the calendar you want to display. The reading pane updates. To go back to your default Calendar view, where all your calendar items display on one calendar, tap the Default Calendar button. Appointment Colors - The color of an appointment depicts what calendar the event belongs to. You might have more than one calendar, or view someone else’s calendar, and each calendar can have a color associated with it that you assign in the Web Client. You can distinguish from the Month or Day view what calendar the event belongs to by the color associated with the event. Recurring Appointments - When adding a new appointment, you can select to make it a recurring event. Tap Repeat when creating the event, and you have options to make the appointment Every Day, Every Week, Every Month, or Every Year. When viewing or editing a recurring appointment, you have the option to open a single instance of the appointment, or the entire series. Editing an Appointment - You can edit an appointment, including editing the time and date, or adding new attendees to the appointment. Step 1. Tap the appointment. You can open the instance of the appointment, or open the series if it is a recurring meeting. Please Note: If you make changes to an appointment that you did not create, you will receive a warning stating the changes that you make apply only to your local copy of the appointment. Changes made by the organizer will overwrite your changes. Responding to an Invitation - When you receive an email invitation to a calendar event, you can indicate your response as accept, tentative or decline. You can also edit an invitation response that is already on your calendar. 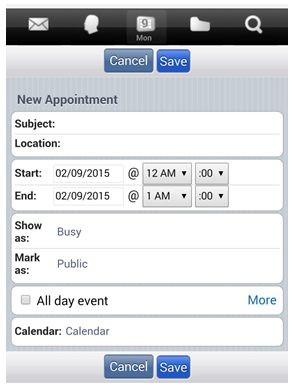 Deleting an Appointment - If you wish to delete an appointment, view the appointment and tap Trash. This action deletes the local copy of the appointment.